Home > Gifts & Souvenir > Necklace w Chain - Labradorite - Silvertone - 10.5"
Found in abundance near the community of Nain, Labrador, this unique mineral creates beautiful jewellery for wear on almost any occasion. One reason Labradorite is so sought after is its iridescence, or the shimmering change of colours as light refracts off its surfaces. The intense colours range from blues and violets to greens, yellows and oranges – and some pieces display all of these hues. 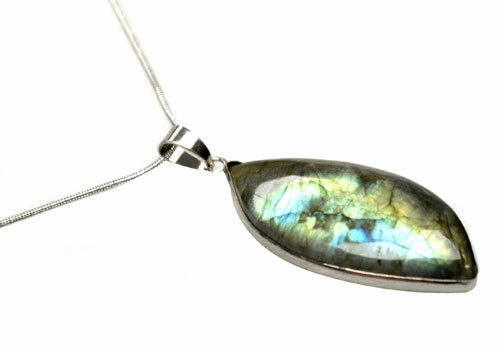 When you purchase a piece of Labradorite jewellery, one thing's for sure: it will be one of a kind. 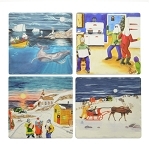 Coasters Ceramic Corked Backed - assorted - 4 per pkg - 4" x 4"